Z is for Zebadiah Sneakfork. Sneakfork is the butler at Cadblister Hall. He does not like his first name to be generally known, as it is, in his opinion, Somewhat Lacking In Dignity. It was an hour later. All of the pursuers had been rounded up and corralled in the drawing room; the bodies had been brought up to the house. Since neither body was in any condition for formal viewing, Sneakfork had overseen their temporary interment in the wine cellar, and felt a vast relief as he locked the door on them. But he was not immune to Sentiment, and he’d known the Viscount since he was a baby. And, dashing a tear from his eye, he went slowly up the cellar stairs, and made his stately way to the drawing room. The Proceedings had not, as yet, Re-Commenced, and Sneakfork took this opportunity for a little quiet Observation, with a view to reporting it later to Mrs. Doombane the house-keeper and other Personages. In the drawing room, all was as it had been, with several important lacunae. The Countess and the Viscount were, obviously, Not Present. Lady Belinda sat now with Miss Bantree and Mrs. Merriweather, who were trying to Say The Right Thing to a girl so suddenly Bereft. She seemed, on the whole, to be taking it quietly; she looked tired and shocked, but as if a nightmare was finally at an end. Also Not Present were Mr. Randall Grudge, Doctor Brandwood, and Verity Meadows. Mr. Grudge had been carried up to the sick-room by James and John, the footmen. Doctor Brandwood was seeing to the young man’s injuries; Miss Meadows was possibly offering the injured man other and more Domestic Comforts. Sneakfork was relieved to note that That Violet Teasdale, the journalist, had Taken Herself Off. Miss Bantree had presumably Sent Her Home, and not before time, either. There would be enough of a Scandal as it was. Kate the kitchen maid and Alfie the Boots were also no longer cluttering up the place; Sneakfork, who had felt that their presence was Not Required previously, had been firm on the point this time. It took Sneakfork a moment to put his finger on the other Absentee. Ah, yes, that Mrs. Goodkind. She did not appear to be present. Presumably, she’d gone back to her cottage. Sneakfork did not like witches, because he couldn’t place them. They didn’t Fit anywhere in Sneakfork’s rigid social hierarchy. They were generally awful-looking and Common As Mud, and yet one could not Snub them, or tell them that if they wished admittance, they should present themselves at the tradesman’s entrance. Mr. Herman T. Ermyntrude- that was, Sneakfork corrected himself, Richard Crabtree- and Aunt Theodolinda were still in their makeshift beds. Aunt Theodolinda looked as if she’d recently had a good nap; her eyes, bright and interested as a bird’s, darted about the room. 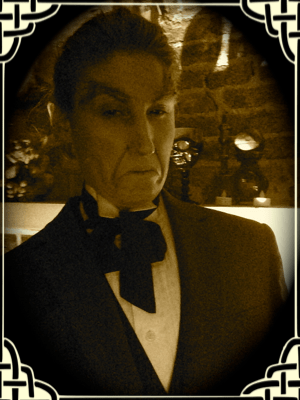 Richard Crabtree (a fine gentleman, Sneakfork considered, from an excellent family, though his American Ways were a little odd), looked, by contrast, rather glum- and no wonder, with his sister-in-law and nephew lying dead in the wine cellar, and his brother so recently dead. Yes, Sneakfork thought, he had always thought well of the fellow, even when he came to the door of his familial home as a stranger. Sneakfork had a very good memory- if one defines a good memory as a memory that retains only that which is convenient. The Vicar sat with the Colonel, and seemed to be offering the man some Spiritual Consolation. Sneakfork heard the Vicar say to the Colonel, “My dear man, she was really a ghastly woman, and her death is very fortunate for you. For I don’t quite see how else you could have avoided proposing to the lady. There’s always India, of course, but your constitution-” Sneakfork nodded gravely. Yes. The Vicar was offering Spiritual Consolation. All was well. Sergeant Mug was In Consultation with Constable Wilkins. The London Expert, Sneakfork decided, Taking The Local Man Into His Confidence. Much To Be Learned On Both Sides. “Being out in the countryside, you don’t get to see many plays until they’re all moth-eaten and tired out, like. I know. I grew up in the country myself. But, Wilkins me boy, let me tell you-” Consultation, Sneakfork thought, firmly. At this point, Crowner rose from his chair by the fire. He was looking, Sneakfork considered, indecently happy. Then again, perhaps it was as well that no-one would have to be hanged. “Ahem,” said Inspector Crowner. He looked around the room, and his eyes glinted with mischief. “I don’t suppose any of you want me to explain? Murder is so Lowering,” he said as his eyes flickered over Sneakfork. “Let’s all forget about it.” And he made as if to leave the room. He was told very firmly that that was exactly what was wanted. “Oh, right! I wanted to give Lord Cadblister enough money to pay off the debt. But somehow, I never managed to meet up with him. And then I saw, from the bar at the Yeoman’s Arms, him going to that village meeting on Christmas Eve. Well, by then I’d heard a lot, and some of it was worrying. I decided I’d lurk in the woods along the lane and try to have a private chat when he was on his way home. But people kept coming up the lane, and I didn’t want to explain myself, you see? So I stepped into the woods- and, well- I got kinda turned around. I used to know those woods real well, but- that was thirty years ago. Anyway, I got lost. Eventually I located the village again and went to bed. I didn’t know my brother had been killed until Christmas Day, when I tried to see the family up here.” This time, Sneakfork noticed with a certain amount of mortification, the man definitely winked. “My dear fellow!” The Vicar beamed. “And I presume that you will pay off the mortgage on the village? Lovely, lovely. It really seems as if all is ending rather well. With certain tragic exceptions.” This last was, Sneakfork thought, added as a gesture to Lady Belinda. “Now get on to the murders, dash it,” said the Colonel. This caused rather a Sensation. And then the old lady smiled, nodded, and explained. Richard Crabtree whistled. “No, ma’am they have not. But that sure is a weight off my mind. I keep thinking that Crowner’s just waiting for the right moment to clap the cuffs on me for my father’s murder. It was George, after all, then? Well, well. I kinda thought so. Yes sir! I did just think it might be like that. But- say! Why didn’t ya come across with this at the time?” And he looked at Aunt Theodolinda in mild reproach. Lady Belinda went to the old woman and took her gnarled hand. “Not a member of the family?” She said. “What rot! I hope you’ll allow me to keep calling you Aunt Theodolinda- won’t you?” And Aunt Theo patted the girl’s hand and smiled. The old woman succumbed to happy tears, Quite Overcome. Sergeant Mug blew his nose loudly, Visibly Moved. Inspector Crowner scowled. He was encouraged to get on just as rapidly as he liked. Everyone wanted to know what had, in fact, happened on That Fatal Night, or rather, on Those Fatal Nights. “Inkling? How?” Growled the Colonel. “But- but Randall had said he wouldn’t go to Argentina,” said the Vicar, looking confused. “No,” said more or less everyone. Sneakfork joined in and made confirmatory noises with the rest of the room. The room made noises of comprehension. “Get on,” barked the Colonel. “Really! That is too wicked!” Cried Mrs. Merriweather. The Colonel looked at Miss Bantree with a kindling of interest. Perhaps he was thinking that conversation with this woman would be an altogether snappier affair than it could ever have been with the Countess. Sneakfork had always rather thought that the Colonel would do better with Miss Bantree than with Her Ladyship. Perhaps… but Crowner was speaking again. “And now for the attempts on the life of Richard Crabtree. You seem, by the way, to be a singularly difficult man to kill. Shipwrecks, stabbings, poison- all just slide off you, it seems.” This seemed almost to irritate Crowner. “Hm. Yes, you could look at it that way. Anyway, this is where the Countess comes in. She had, by this point, come to realize that it was her son who was murdering people left and right. Woman’s intuition, I wonder, or did her son confess? We will probably never know. But the Countess was determined to protect her son, and herself as well. When we came to ask her some searching questions, with a view to a possible arrest, she invited Mr. Herman T. Ermyntrude to come and visit the Hall. He came on the double, for he wanted to get to know his family. She then proceeded to rip his whiskers off and reveal that he was, in fact, Richard Crabtree, alleged murderer of thirty years ago, and an obvious candidate for the gallows for these murders, too. At least, so she thought. She thought that murderers murder, you see. If she gave us a man who’d done one murder, we’d think he’d done ’em all. Silly.” Crowner shook his head at this Folly. And, quite abruptly, they were gone. For a moment, total silence reigned in the drawing room. And then Richard Crabtree spoke. Sneakfork smiled in an avuncular manner. “Yes, my Lord. Brandy would be quite suitable.” And he glided out of the room to fetch the needful. It was a great ride. Thanks so much for sharing this. I know you say it isn’t so, but I think this was a hell of a challange. Writing a murder mystery is already a great fit in my opinion, but doing it in a month, following the alphabet, with pictures and other material… that’s quite a fit! I’d love to see this in e-book, are you planning anything on that line? Hey Jazzfeathers! Ah, the witch- she was the source of the poison that the Countess used; Crowner hints at that, but doesn’t come out and say it. But that is probably one reason why the witch was able to save Richard Crabtree- she knew what poison was used. But I didn’t want to come out and say so in the text, because I want to leave it completely up to the reader to decide whether the witch actually has magical powers or not. This was a whole lot of work, I admit it- but it was a lot of fun, too! And I badly needed a break from editing my novel (also a mystery, but it has a modern American setting, though there is a lot of 1940s old-time radio detective show stuff mixed in, too), and this was exactly the right sort of break to take. Following the alphabet did present some additional challenges- but I find that odd restrictions like that are really good for my writing. I, too, would love to see this in e-book; perhaps a revised and expanded text, and more pictures and things? I am going to look into that. You did this challenge magnificently! Bravo! (Applause) Amazing job, I enjoyed it immensely. The characters were all so well drawn. I think the only thing that confused me, other than the part about the cars, was that Crowner acted like he was trying to figure out a motive for Gerald, when to me, Gerald had obvious motives. That’s why I thought the murderer had to be someone else. Does Randall Grudge survive? And speaking of surviving, congrats for surviving A to Z in such rousing fashion! Hey Lori! Randall Grudge does survive- he has to marry Miss Meadows, so it would be unkind to kill him off! And the motive was indeed obvious- next time, if I do this again (and I’m sure I will do something at least similar to this in the future), I will have to be more subtle. I’m glad this gave you a good break from your other project. I know how difficult the editing phase must be going!